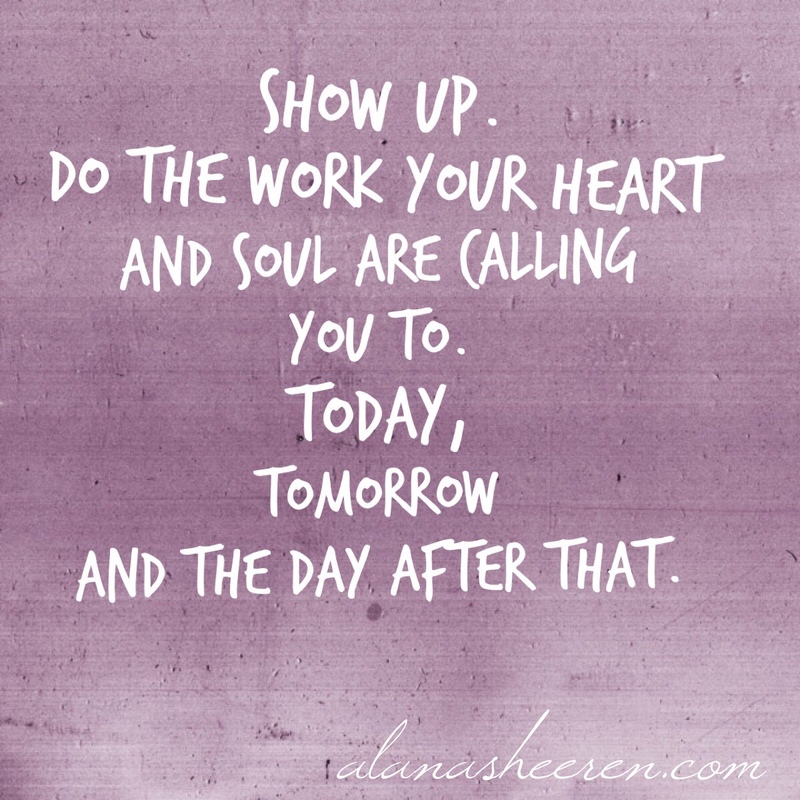 Mantra Monday: Show up. Do the work. Behind the scenes over here magic is happening. My mind and heart are being blown open on an almost-daily basis. And I’m juggling what it all means for my life: increased self-care, stronger boundaries, new schedules and structures and big learning curves. I’m letting go, finding space and asking for help. I’m also getting clearer on exactly how I want to show up in the world, whether it’s in my life at home with my husband and daughter, in my work with my amazing clients, with my friends or in the private, internal world of my heart and soul. The one thing that’s not in question is that the calling to show up and serve in bigger ways is fierce. And in order to do that, I need to do the work. The work of getting enough sleep, of saying No (thank you) more often and Yes (please) when it makes my heart sing, of having more fun, of lighting candles and chanting mantras, of staying grounded and centered and playful, of making time to sit by the ocean’s edge. The work of being fully present for my family, for my clients, for my life. The work of being the most aligned, beautifully-broken-open-and-pieced-back-together, vulnerable and loving human being I can be. This is the real work for all of us – to be our happiest, most filled up, most lit up selves. Show up. Do it to the best of your ability. Make a difference by being who you are. If you hate your job and dream of moving to Nashville to write country music then show up, every day, and do the work that takes you one step closer to Nashville. Note: This is not easy. Walking steadily towards a dream takes massive amounts of courage, vision and trust. And if you’re thinking the big picture is foggy and you feel like you have no answers or clarity, then show up in that. Keep asking the questions and washing the dishes and putting one foot in front of the other in the dark. P.S. If you’re feeling stuck or unsure of what your particular brand of brilliance is, a Fresh Start is a beautiful and gentle next step to take.